$6,495.00 to $6,795.00 & FREE Shipping on orders over $59 $35. Easy accessibility is the name of the game with the Low Rider all grain brewing system. The Low Rider is our top of the line Single Tier Brew Sculpture that allows you to look into and interact with every kettle without the need for a step or ladder. The easy access is one reason the Low Rider is preferred by professional breweries like Sierra Nevada and Russian River for test brewing. Includes two pumps. Where the Tippy Dump system utilizes gravity to drain wort from the mashtun into the boil kettle, with the Single Level you use an additional March Pump instead. 304 Stainless Steel TIG welded stands. 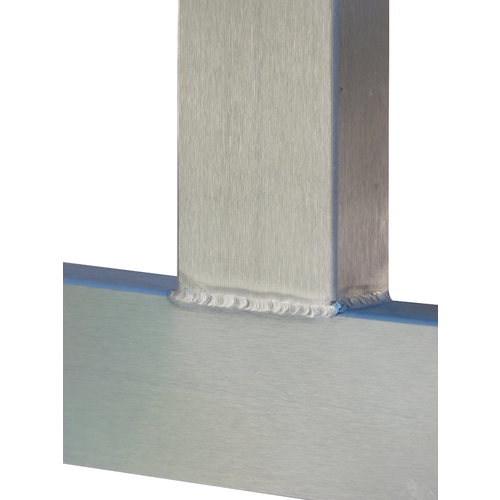 The ultimate frame material that will outlast you. No paint or powder coating. Every BrewSculpture™ includes folding handles and built-in rear casters that allow you to move your BrewSculpture™ with ease. Oversized 304 stainless BrewBuilt Kettles with welded fittings, notched lids, internally etched volume markers, aluminum clad bottoms, and silicone handles. Built to last. Our "Large" option will come with 22 gallon kettles, while the "XL" model will come with 30 gallon kettles. The fluid path is easy to use and clean. 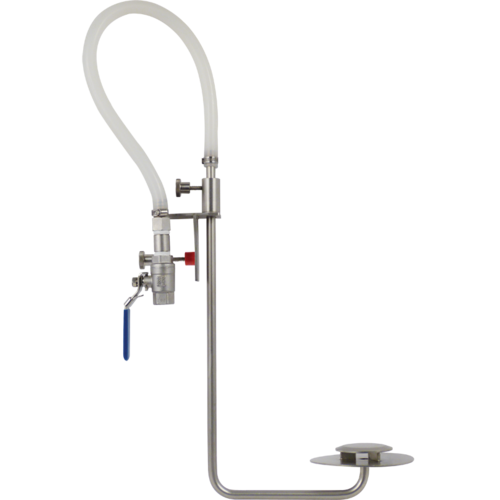 We've included the time tested, top of the line March pumps along with heat resistant food-grade silicone tubing and our own specially designed stainless quick disconnects. 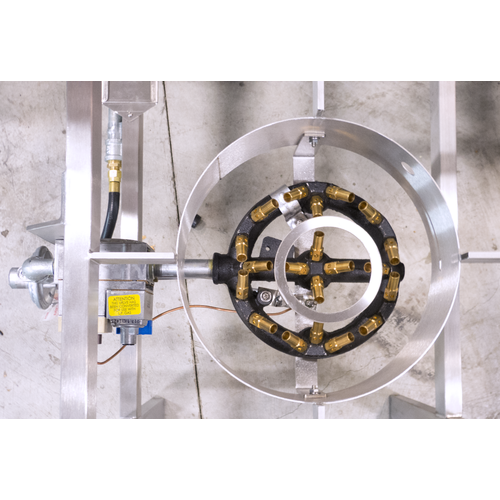 Mashtun includes the Ultimate Sparge Arm with innovative design to eliminate hot-side aeration. The center draw outlet with quick disconnect is locked in during mashing but easily disconnects for cleaning. The mash screen has a very low volume of base water under the screen to aid with efficiency and mash consistency. 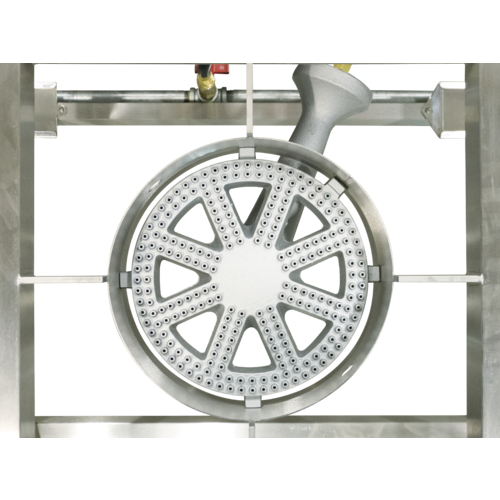 The perforated stainless mash screen is reinforced for use with pump recirculation and includes a silicone gasket to make a perfect seal with the kettle wall. Internally etched volume markers make mash water additions super easy. Boil Kettle includes innovative Whirlpool maker for leaving hops and trub behind. Volume markers are etched on the inside so you know exactly how much wort you have at all times. The lid notch is super handy for hanging hop bags, using an immersion chiller, etc., but when not is use an included silicone plug seals the notch. The bottom of the boil kettle is tri-clad with a 4mm aluminum core sandwiched between two layers of 304 stainless. The aluminum core eliminates scorching and the cleaning that comes with a scorched kettle. The ultimate in control, flexibility, repeatability, and ease-of-use. Only the very highest-end commercial breweries have digital, touch-screen, control panels. You’ll have one at home. Built around a 7 inch touch screen, with resistive touch, it controls times and temperature, while reminding you when to make additions throughout the entire brewing process. Easy Mashing - Choose from 3 preset mash schedules or Custom design your own with up to 5 steps. From there the control panel guides your mash through the temp raises and time rests automatically. Always Hot - Controller maintains the Hot-Liquor tank temperature you choose by turning the burner off and on automatically. Manual Mode - allows you to control pumps for anything you want such as cleaning. Please Note: Natural Gas Sculptures require installation by a professional plumber. These units terminate in a ¾” Male Flare connection, and have multijet burners as opposed to the banjo style displayed in the pictures above. 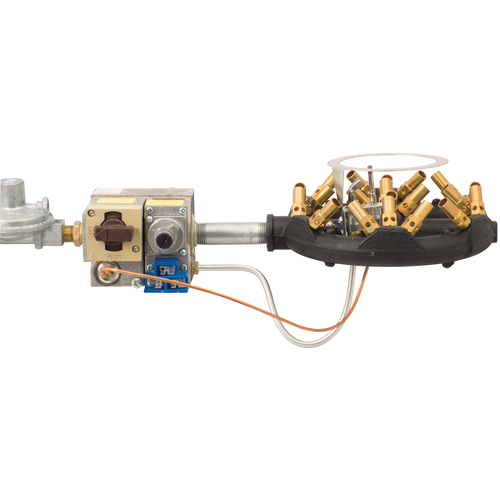 Can this be ordered to get all burner parts to be either propane or natural gas? BEST ANSWER: Unfortunately not. These systems will only be built for either natural gas or propane but not both. We do sell a conversion kit so that you can convert a system from natural gas to propane, but not the other way around. Can you provide the link to the conversion kit from gas to propane? The system shortens my brew day. With 3 gas burners, I can heat mash & sparge water simultaneously and fast: Thirty minutes to heat 13 gallons in HLT from 68°F to 167°F; less to heat strike water (less quantity). I can be mashing about 15 minutes from start up. The system is safe. No more climbing on a ladder to check hot water levels, etc. Everything happens at eye level. The mash process is a continuous sparge. 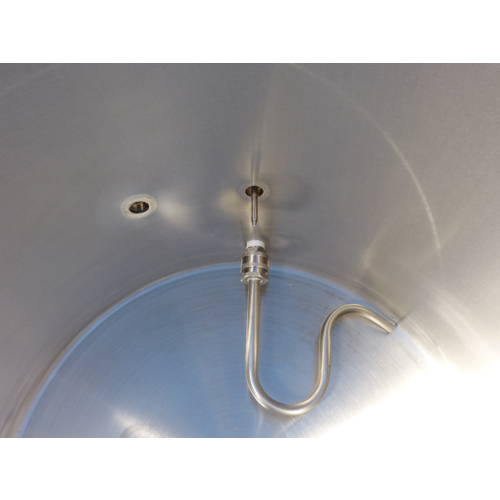 Mash water circulates from the mash tun, through the heat exchanger in the HLT & back to the mash through the sparge arm. Mash temperature is controlled by pre-programmed temperatures (automatic on/off burner) on the HLT. A timer sounds when each mash step is completed. The mash temp is automatically raised to the next step. Nice. The touch screen digital control system is simple and easy to use. Gone are my days of forgetting to add hops, Irish moss, or whatever additives at the correct time. A (loud) timer will alert you at the prescribed moment. 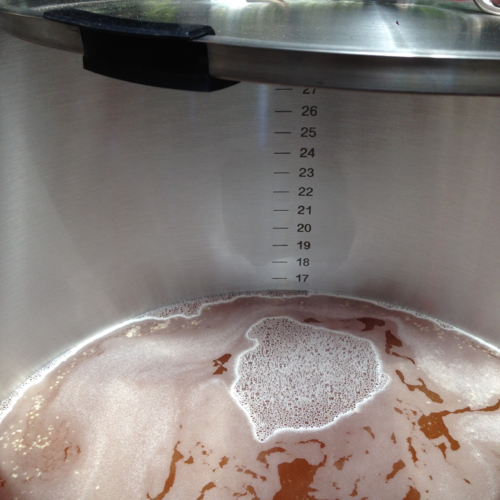 Meanwhile, you can be cleaning up during the boil without fretting & forgetting that next addition. 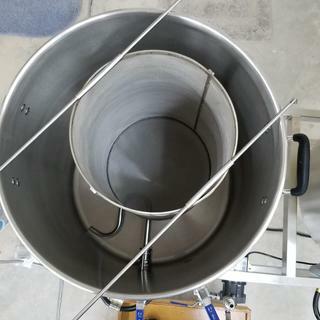 The 22 gallon kettles (intended for 10 gallon batches) minimize the potential for boil-over and have the capacity for a large grain bill…useful when brewing heavy beers. Some method to screen hops (flower or pellets) & trub from the wort is needed; otherwise, pumps, tubes, & plate chiller will clog up fast. For my first two brew sessions I used a hop bag with a spyder. I was not pleased. So I purchased a stainless steel basket, 300 micron screen, 10.5” diameter x18” deep. See photo. Problem solved; the basket is easy to clean. The system is intended for 10 gallon batches. 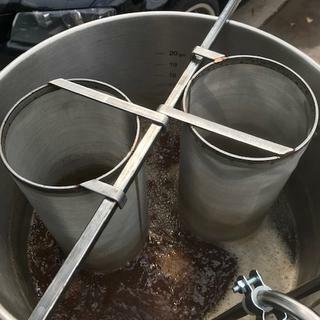 Because of the location of the temperature probes, 5 gallon batches won’t work…unless you plan to brew a 5 gallon batch manually (without automation). Yes, the BrewSculpture cost is more than an orange cooler system...a lot more. 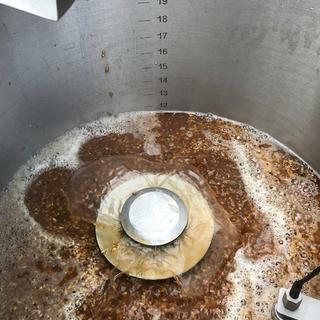 After 10 years of home brewing I have learned to appreciate the benefits of consistency, simplicity, convenience, and safety in home brewing. My Low Rider digital BrewSculpture provides these qualities. 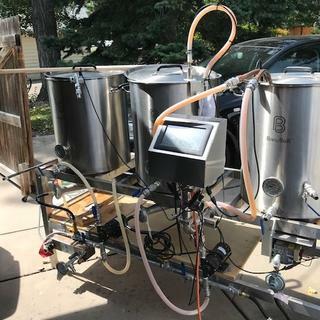 I've brewed over 25 batches and the system is a solid piece of equipment. Easy to dial in temp for various styles. only drawback from others out there today might be the lack of a plate chiller mounted on the frame but worth the spend to produce consistent batches. Good but not perfect value to cost. This is really designed for a minimum 10 gallon batch. The temp probe in the mash/lauter tun is too high for a 5 gallon batch. And the height of the temp/liquor level sensor in the HLT requires quite a bit of extra water to be included. All that said, with some adaptations and adjustments I have made this functional for 5-15 gallon batches. The controler works well and it is quite a treat to operated. If you have the $$$$ to spare, it is a dream.